Bottom Line: a nice and compact desktop speaker that’s truly optimized for its intended purpose. Definitely best if paired with an external subwoofer. A bit dated now. NHT Audio is a lesser known niche American audio company, but has actually been a low-key favorite in the audiophile community for many years, one reason being that they really optimize their products towards specific purposes while other speakers tend to be jack of all trades (on paper at least) and master of none, so to speak. Enter the SuperZero 2.1 Mini Monitor: a budget speaker that is truly and unabashedly designed to be a great sounding mid/high-range speaker without a high-range price tag. Some audio companies will try to take a two way bookshelf speaker and “stretch out” a smaller mid-range woofer to get more bass, or at the very least a nice looking response floor spec. While the “better” specs on paper might look appealing to a layperson, the problem is a two way bookshelf speaker design just isn’t meant to reproduce the full range with deep bass – rather it’s meant to reproduce just the mids and highs and defer the bass to an external subwoofer. A lot of these so called full range bookshelfs just wind up sounding lousy or they have a huge drop off well above the quoted response floor, meaning a lack of bass. Not the SuperZero 2.1s though – while the response floor is relatively high, not only do they quote a less than 3 dB variance in the response curve, but they back it up with published graphs. The only other company we’ve seen do this is Fluance, and while a company’s self reported data still must always be taken with a grain of salt, the extra transparency is always a good sign. While these speaker may well sound perfectly good on their own, they’re really designed to work in conjunction with a subwoofer, and NHT indeed makes one (review forthcoming) as part of the full system lineup. Any decent subwoofer would work fine, though. The power specs are pretty modest, but again, this speaker unabashedly is what it is: a close/mid-range bookshelf that’s truly optimized for mid/high sound reproduction. 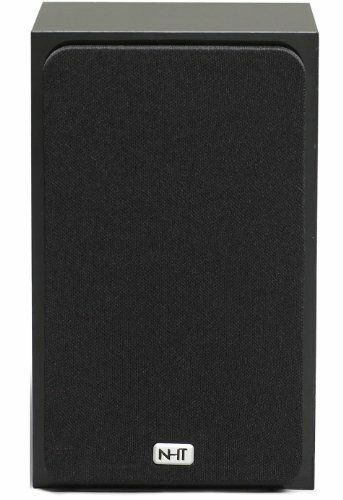 The cabinet design is part of this optimization – the speaker has a smaller 4.5 inch woofer and is sealed. Sealed cabinets are less common, but their advantage is that they can really move a lot of air while being smaller, and of course this also brings the added convenience of an unobtrusive speaker. The true “mini” monitor is only ~6 inches wide and deep while weighing less than six pounds, perfect for a desktop setting. The drivers are a paper blend, which, if well made, has the propensity to sound really great at close range and lower volume. 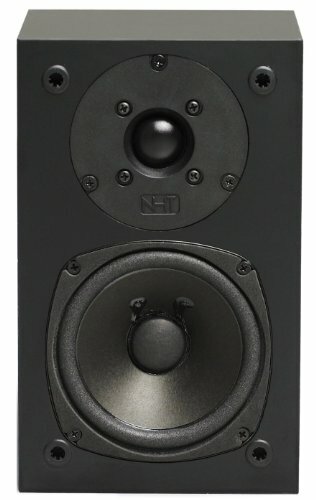 They’re more prone to damage or general wear and tear, but NHT offers a 5 year warranty on its passive speakers which is on par with industry leaders. How do they look? Pretty much on par with any other plain budget bookshelf speaker – pretty unassuming, but not ugly at least. Probably hard to go wrong with an NHT speaker set, but, though these are an improved iteration upon already popular past designs, the SuperZero lineup is now several years old. There are definitely a few products that have subsequently come about that would give these a real run for the money. Check out the links below for some alternative recommendations.